The Year’s Top Ten Tales of Science Fiction 2 is now on sale! 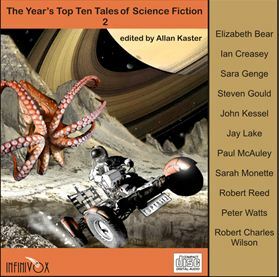 An unabridged audio collection of the “best of the best” science fiction stories published in 2009 by current and emerging masters of the genre, as narrated by top voice talents. In “Erosion” by Ian Creasey, a man tests the limits of his exo-suit prior to leaving a dying Earth. In “As Women Fight” by Sara Genge, a hunter, in a society of body-switchers, has no time to train for a fight to inhabit his wife’s body. “A Story, with Beans” by Steven Gould considers the role religion plays in a dystopian future with metal-eating bugs. In “Events Preceding the Helvetican Renaissance” by John Kessel, a monk in the far future steals the only copy of a set of plays from a repressive regime and uses this loot to free his people. In “On the Human Plan” by Jay Lake, a mysterious alien visits a far-future, dying Earth in search of the death of Death. Set in the Jackaroo sequence, a detective in “Crimes and Glory” by Paul McAuley chases a thief to recover alien technology that both aliens and humanity are desperate to recover. Set in the Lovecraftian “Boojum” universe, “Mongoose” by Sarah Monette and Elizabeth Bear, a vermin hunter and his tentacled assistant come on board a space station to hunt toves and raths. In “Before My Last Breath” by Robert Reed, a geologist discovers a strange fossil in a coal mine that leads to the discovery of a peculiar graveyard. In “The Island” by Peter Watts, a woman on a spaceship must decide whether to place a stargate near an alien society that will ultimately destroy it. Finally, “This Peaceable Land; or, The Unbearable Vision of Harriet Beecher Stowe” by Robert Charles Wilson is an alternate American Civil War history in which the war was never fought, slavery gradually disappeared, and Uncle Tom’s Cabin was never published. And to top it off, Infinivox is offering $1 shipping in June. Here’s your link, go check it out!